Devotees may balk, but there’s some case to be made for the refashioning of Saint-Exupéry’s tender classic into a Pixarian, celebrity-voiced message movie. Earlier this summer, Steven Spielberg plummeted into the pitfall of fidelity with The BFG, which proved that the magic of a kid-lit touchstone can be lost in translation, even (or perhaps especially) when you remain faithful to its plotting. There was probably no replicating the intrinsically literary, welcomingly philosophical appeal of The Little Prince either. So maybe director Mark Osborne (Kung Fu Panda) and his screenwriters were on to something when they invented The Little Girl (Mackenzie Foy), a plucky window into the text. Daunted by the literal life plan constructed by her helicoptering single mom (Rachel McAdams), our adolescent heroine is drawn away from prep-school prep and into the wondrous memories of her wizened aviator neighbor (Jeff Bridges, basically playing The Giver again), an elderly version of the author-surrogate narrator from the original novella. The Little Girl spends her summer vacation hunched over The Aviator’s illustrated memoirs, which detail his adventures in the Sahara with the titular character, a child-sized traveler from the stars. In other words, The Little Prince turns its source material into a story-within-the-story, and its heroine into a young reader. The main plotline is rendered through CG animation as detailed and sleekly modern as anything Disney might commission, and the film develops an orderly visual language, mirroring the stifling routine of The Little Girl’s life through symmetrical compositions, repetitive activity, and overhead shots of her boxy suburban neighborhood. This only enhances the offbeat wonder of the flashback scenes (which is to say, the scenes actually pulled from the book), for which The Little Prince employs some particularly striking stop-motion. Osborne, who previously mixed and matched formats in Kung Fu Panda, makes sure that both of the film’s animation styles are flat-out gorgeous, though the more photorealistic sheen of the main thread is no match for the interludes—especially, for example, the moments that make the cosmos look like lamp-lit wallpaper, dotted with glow-in-the-dark decal stars. 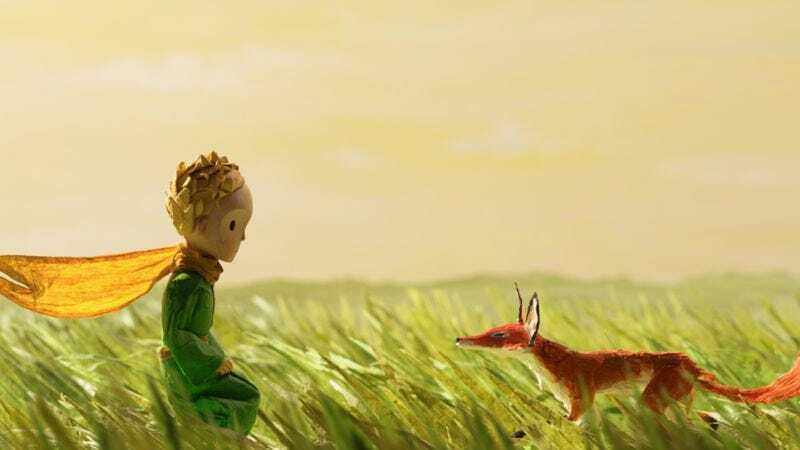 Aesthetically, the contrast between The Little Prince’s perpendicular storylines is lovely, the stop-motion passages cutting in like intrusions of liberating fantasy. Narratively, however, putting these two tales—one original, the other a widely beloved staple—up against each other creates some unflattering feedback. The scenes with The Little Girl are sensitively handled, thanks to some nicely expressive character animation and strong voice work. But they’re also highly conventional, transforming Saint-Exupéry’s puckish questioning of adult values—his belief that we have to hold on to the open-mindedness of youth—into a kind of preachy lesson about not growing up. Meanwhile, the creators largely reduce the author’s incidents to intertext: The Swiftian satire of The Little Prince’s interplanetary encounters is diminished through truncation, while a crucial episode involving the taming of a fox loses its significance in montage form. 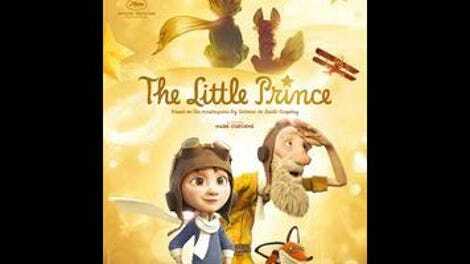 In a sense, The Little Prince himself becomes a background player, popping in for cameo appearances between scenes of a daughter struggling to escape the expectations of her well-meaning type-A mother. These are the complaints of a protective fan, disappointed to see the meat of an all-ages masterpiece presented as the side dish. Does the outside-the-box thinking of making this Little Prince its own entity count for anything when the result is a fairly ordinary (if beautifully animated) big-screen cartoon, complete with race-against-the-clock climax? Would some attempt to actually capture the episodic, poetic nature of the novella have been a more noble pursuit, even if those are qualities incompatible with the demands of feature-length family fare? From its prose to its watercolor illustrations (both supplied by Saint-Exupéry, twisting autobiography into a flight of fancy), the book was the work of a single artist’s vision, so it’s no wonder its value couldn’t be approximated by the small army of an animation studio. Better, then, to think of this handsome, inoffensive Little Prince less as an adaptation than as a tribute—one that makes the relationship between the book and those who love it a central focus. Anyway, can you really blame a bunch of serious-minded adults for failing to entirely capture the spirit of the work? They look at elephants inside boa constrictors and see only hats.